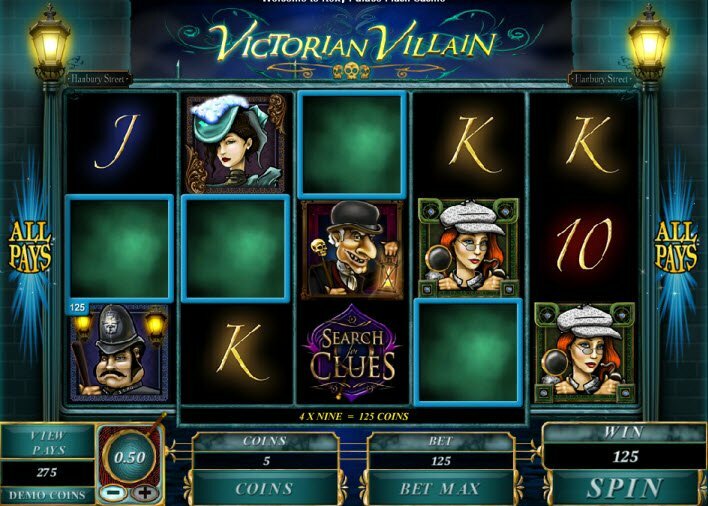 The Victorian Villain Slot takes inspiration from Sherlock Holmes. It’s theme references a crime mystery which takes place during the Victorian era. Characters on the reels wear period clothing. Play Victorian Villain to experience the suspense and thrill of a Sherlock Holmes novel, and still receive lots of bonus prizes. 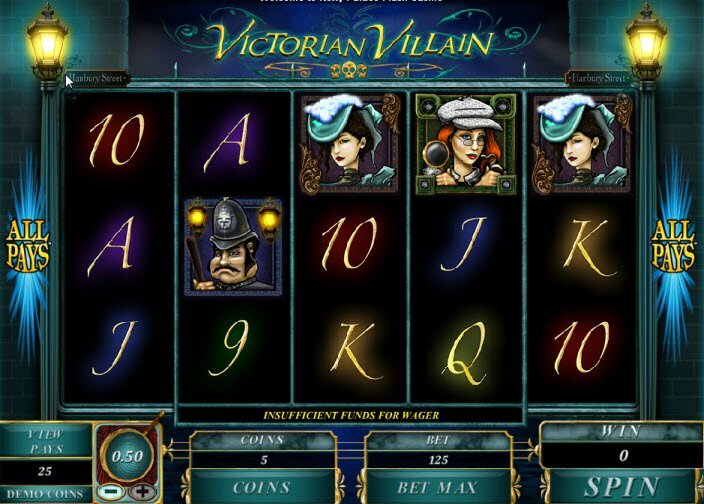 Get into the mystery and madness of the Victorian Villain Slot. Powered by Microgaming, this video slot contains 243 ways to win. In addition, the game creates an atmosphere of excitement and intrigue. Best of all, Victorian Villain includes not one, but two Scatter Symbols. Both reward Free Spins, Multipliers, and other mysterious prizes. It’s Elementary My Dear Watson! There’s no denying that Sir Arthur Conan Doyle’s novels about Sherlock Holmes inspired the game theme. The setting takes place during the Victorian Era in the midst of an unsolved crime. The suspecting constable, inquisitive detective, exquisite lady, or dubious villain all participate in this video slot. Spin the reels and listen to ominous footsteps and malicious laughter echoing down a long, dark corridor (or so I imagine). The graphics could use some improvement, but the overall atmosphere makes for a great game. When three Scatters appear on the reels, you have the choice between 15 Free Spins with all wins multiplied by 3, 10 Free Spins with all wins multiplied by 5, or 5 Free Spins with all wins multiplied by 10. 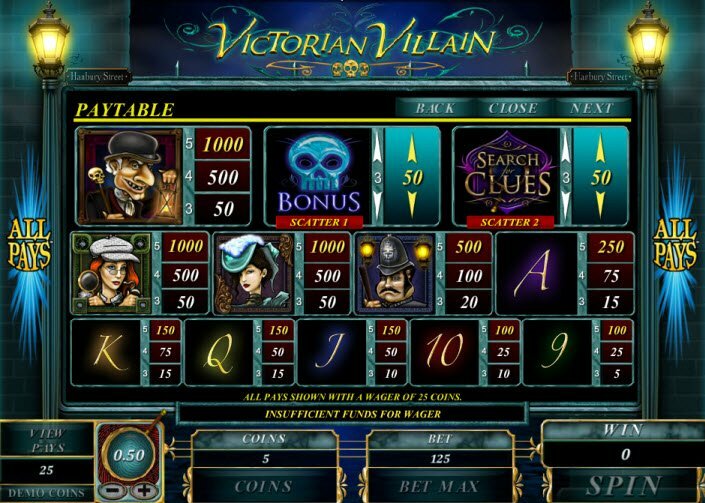 Victorian Villain Bonuses reward your choice of Free Spins and Multipliers. All wins pay left to right on adjacent reels. The Victorian Villain logo functions as the Wild Symbol and substitutes for all symbols except Scatters. In addition, the game contains not one, but two Scatter Symbols, the first of which appears as a blue skull and activates the Villain Free Spin Feature. When three appear on the reels, you have the choice between 15 Free Spins with all wins multiplied by 3, 10 Free Spins with all wins multiplied by 5, or 5 Free Spins with all wins multiplied by 10. The second Scatter Symbol triggers the Search for Clues Feature. During this feature, players must select items in the room to redeem prizes.